It was only about a week ago that I made cupcakes and professed that I’m not that big of a frosting girl. And yet here I am, sharing a bundt cake smothered with cream cheese frosting. To be fair, there are a few factors that lead to the creation of the above pictured cake. M took a new job title with a few more responsibilities, November marked a year since we started this crazy California journey, and last but not least, I got impatient with the cake and it fell apart. Truth be told, the last fact is truly why this cake ended up with frosting. 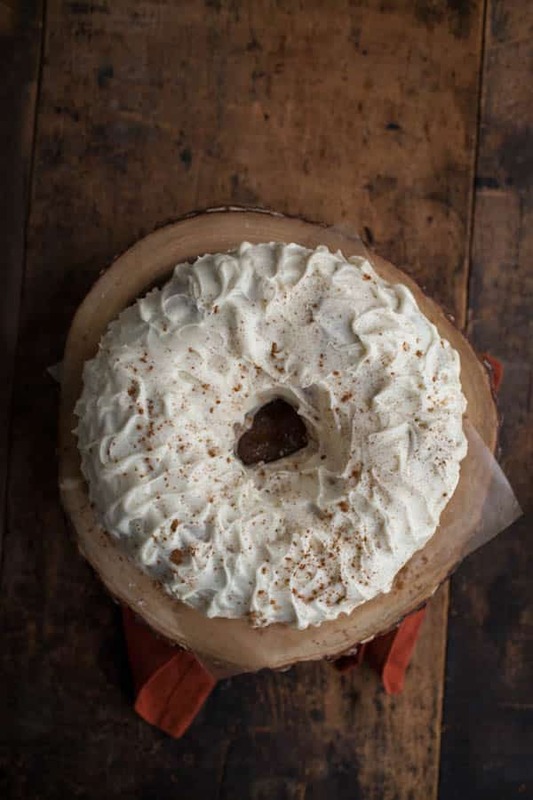 This bundt cake is perfect without frosting but when you try to flip the cake while it’s still hot (and you forgot to grease the pan), it tears in half. This bundt cake mishap also reminds me why I love having a business partner who loves food just as much as me. I texted Melissa if she thought I could put frosting on a bundt cake and within minutes she responded back with photos to assure me that it was alright. So, this cake turned into a celebration cake for M (he loves cream cheese frosting). The cake itself would work well with any fruit but given the season, apples are perfect. I often cheat with the milk cooling step by tossing it in the refrigerator (that impatience that tore the cake in half runs rampant in my kitchen, I’m working on curving it but M is convinced my life theme song is Veruca’s song from Willy Wonka.) With or without the layer of cream cheese frosting, this cake is a winner! 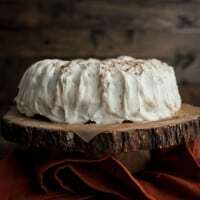 Beautiful Autumn cake – can I guess how amazing it must smell?! Amazing looking cake – especially on that stand! Every baker has the “bandaid” cake story, right? More than once I presume. It always turns out well though. I always think of BIll Cosby eating a piece of chocolate cake when he wasn’t supposed to. He ends up stuffing the missing area with paper towels and puts frosting over it! Pretty hilarious! 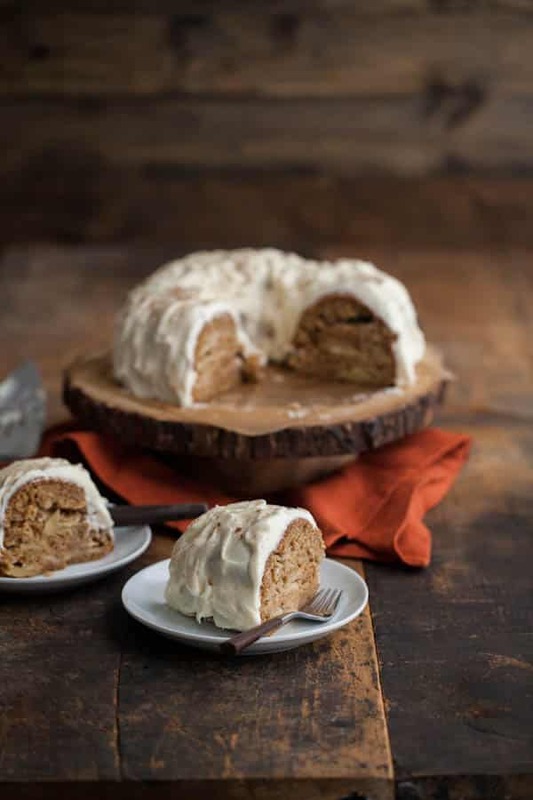 I LOVE apple spice cakes… and if it has cream cheese frosting, even better. Perhaps I’ll make this for my husband’s birthday this weekend! 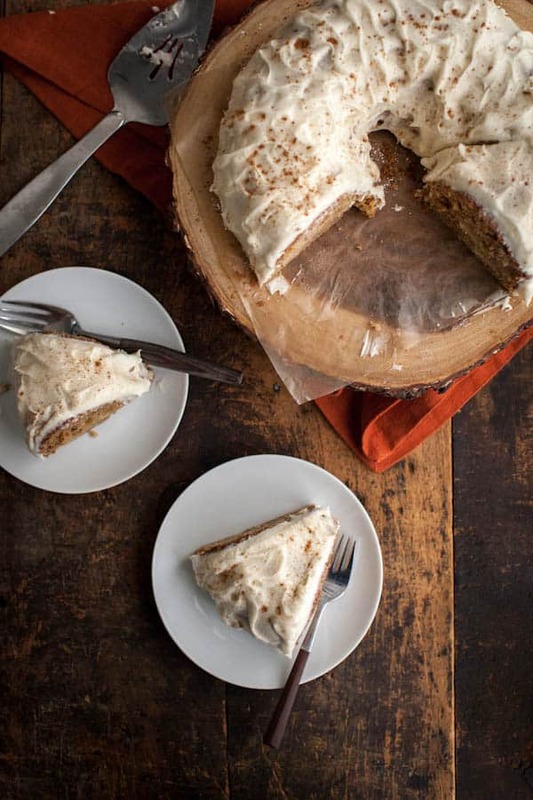 This cake is perfectly spiced and the frosting looks unreal! Lovely! Erin this sounds amazing!! Cracked top or not! I’m definitely going to make this during the holiday season. This looks delicious! And I like the idea of frosting. I always end up having cakes like this with ice cream or whipped cream anyways! yes a million times to this. I am always up for cream cheese frosting so no need to apologize! And with the frosting you can’t even tell that it broke! Good move. I love a good cream cheese frosting. This sounds fantastic! apparently, i have the patience for cooling the milk but not waiting until it cools before putting the icing on. This was the best cake I have ever made. My 12 y/o son and his 3 friends loved it!